The Arkansas Democrat oral history project was launched in Spring 2005 to capture the history of the publication's operations in the late twentieth century with a focus on the famous newspaper war with the Arkansas Gazette. Democrat publisher Walter Hussman Jr. renamed the newspaper the Arkansas Democrat-Gazette when he bought the Gazette's assets in 1991. The Hussman Foundation has provided generous funding for this project. Jerry McConnell, who has had a distinguished career in print journalism, has served as the project director. He took his first newspaper job with the Arkansas Democrat in 1951 before moving to the Gazette in 1955. He returned to the Democrat in 1971 as managing editor and remained there until 1978 when he moved to Oklahoma to work for both the Oklahoman and the Oklahoma City Times. He retired in 1991 and moved to Greenwood, Arkansas. 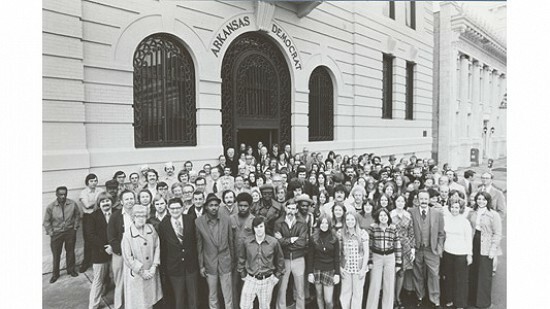 Arkansas Democrat employees pose in the mid-1970s. The man on the far right is publisher Walter Hussman Jr.